Delta National Park | What’s more fragile - the Delta or the BDCP process? An editorial in the May 13th Sacramento Bee titled “Water contractors need to get real” raises a question about what the real is. My sense is that the Bee’s and the SJV water contractors’ versions are not the same. One, the editorial calls out the state’s water contractors’ wavering on their financial commitments to a BDCP process - one that is already in the nine figures, btw - a process that is probably more fragile than the Delta’s ecosystem. And who can blame the water contractors for all of the wavering? Are they not allowed to avoid what they perceive to be throwing good money after bad? Two, that those same contractors are the parties responsible for providing conclusive scientific analysis and presumably the ensuing development policies for restoring/enhancing/stabilizing (which of these is not entirely clear) the Delta’s ecosystem. Good luck meeting that criteria, water contractors. Because there has to be a scientific Holy Grail that neither Cal-Fed nor the BDCP did not find despite the hundreds of millions of dollars spent on funded research? I digress, but it’s funny thing about blogging on the subject of the Delta and Cal water in general. Unless a post really upsets one side or another, no one seems compelled to comment. For example, when I write that the future of water in California is not a scientific problem, no one (except John Fleck, who might just agree, or at least understands the argument) weighs in. Why is that? Three, the Bee’s editorial reminded the water contractors that the purpose of the process was not to increase the quantity of water supply, but rather its reliability. A law requiring reliable allocation is easy to implement: water contractors will get a RELIABLE allocation of, say, 25 percent of their “rights” (the amount equal to the LOWEST possible flow), since that’s 100 percent reliable. Additional, UNRELIABLE flows will be allocated if/when they arrive (as they are now). The editorial suggests that the onus is on the water contractors to “lay out scientifically defensible steps for improving populations of imperiled fish” in the Delta. But in this context, the scrum that is “science” makes that an all but impossible standard to meet. I mean, how much competent science leading to inconclusive policies needs to be commissioned before smart people admit that this is not a problem of science? And while it might be true that environmental regulation has been effective in reining in the most rapacious of water ideologues, this will continue only so long as the public supports environmental regulation. Devin Nunes and his SJV colleagues on both sides of the aisle are working a long anti-environment game on that front. There is nothing particularly groundbreaking about the Bee’s position here. Or provocative, since it is nothing more than a proclamation supporting the status quo. Provocative would have been for the editorial board to either support the wholesale buyout of the toxic west side agricultural bloc or administering the last rites to a Delta on life support. Hard to not see this process playing out more in black and white than shades of gray. As M. David Stirling writes, also in today’s Bee, giant tunnels or canals aren’t the only solution, despite the warm and fuzzy feeling bureaucrats, technocrats, and big engineering firms get when they argue that they are the only way. 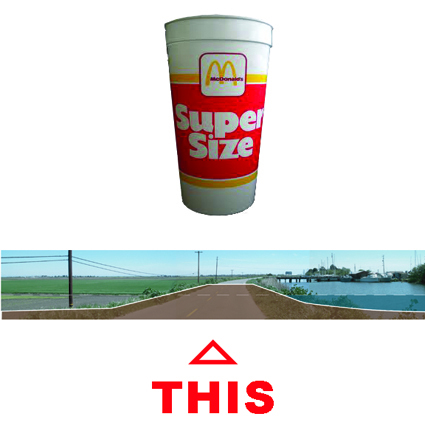 Super-sized levees can do an awful lot of work. They would provide significant upgrades to flood and earthquake risks. If designed as setback levees, then they also can yield thousands of acres of estuary habitat. I’m not sure if Delta landowners understand that implication of the latter, so-called Fortress Delta option, or that they like that very much, by the way…but we’ll cross that bridge when we come to it. So if, hypothetically, Fortress Delta is the answer, given that science won’t settle this, how does FD become the politically preferred option? John, I can think of at least three reasons why the FD (with setback levees) is the most viable of the three alternatives. 1/ It is likely to have much greater Delta and environmental group buy-in. 2/ From what I’ve read, it is on the order of 10 to 20 times less expensive. 3. The above make it a much easier political sell. John - But will it have to wait then until the Peripheral Thingie collapses under the weight of its cost, and then those arguments will become politically relevant? The cost, the question of who pays those costs, and not being able to demonstrate the absolute infallibility of a Peripheral Thingie in event of a quake (a fourth point in my response above, actually) - yes. Consensus around a “good enough” fortress Delta alternative is not going to happen overnight. But some kind of infrastructure remediation is needed, no doubt about that. And to the last point I made in this post, if you start adding up the valuable ag acreage that will be displaced by building setback levees, landowners in the Delta might be (collectively, somehow) giving up more land than if a tunnel’s various surface/property effects might require. JB and JF. Having worked in both NM and CA on water, I see a commonality. The biggest hurdle to get over in CA though is the State Legislature. In NM, recently, a politically potent urban area, Santa Fe, tried to smuggle some water from the rural Estancia basin, and they were rebuffed. Won’t see that in CA. Coastal urban users have dibs on water from either side of the Sierras. see http://www.waterassembly.org for NM’s contributions to addressing long-term regional water planning. Even the Middle Rio Grande’s experience in planning demnstrates that structural water governance reforms, and not science lie at the foundation for addressing supply issues and other infrastructure issues. Martin - Thanks. It seems as though, in both NM and CA cases, structural water governance reforms that might create a foundation for solutions are (easily?) blocked by entrenched interests that would lose out as a result of those reforms. I guess I’m no one. It seems to me that you and I exchanged opinions on this recently in the comments of an op-ed piece. Sooo….you’re not sure if us simpletons in the Delta understand the Fortress Delta option or it’s implications ? Sorry John but that seems more than just a bit elitist to me. There are likely far more landowners in the Delta that do understand the implications than those who do not. Your flippant comment is sadly indicative of the attitude of some who blog on this subject as relates to the relative intelligence and degree of engagement those of us who live here have. Perhaps this explains the lack of response your blogs receive from Delta locals. what are the odds that they have no idea what sacrifices Delta landowners would be required to make to build “Fortress Levees” if it were to happen ? The concept sounds great, but, having lived on Sherman Island for most of my life I can only say I’ll believe it when I see it. Sherman Island has been a majority owned and operated subsidiary of DWR since 1981 and still can’t meet the PL 84-99 standard after 30+ years. If the Delta’s salvation lies with the legislature and ignores science then I suspect we are doomed. As we continue to avoid the root question of how much water is surplus and therefore available for export we’re killing more than just time. Chris, I was referring to here, as in this blog, not somewhere else. We obviously disagree on the value of doing any more science. My point isn’t that people “ignore science,” as you put it. It’s that science is being produced by different groups leading to different conclusions, essentially negating itself as being the basis of “truth,” or “fact,” or conclusive. That’s why this is ultimately going to be a political decision. You disagree. Fine. But what about the science that’s already been produced? What do you think of its quality and impact on policy-making? You estimate that there are “likely” far more landowners in the Delta that understand the implications of the Fortress Delta. That’s not exactly a iron clad endorsement of the group, is it? Still, I understand what you are criticizing me for, so to be clear: I believe farming requires rational thinking and that farmers are therefore rational people who generally make rational decisions. I just did a back of the envelope calculation on how much Delta farm land would be displaced by an extra width of “only” 200 feet for a 50-foot wider reinforced levee cross section plus a 150-foot wide setback intertidal bench on the water side for habitat. 1000 miles of levee x 5280 feet/mile x 200 feet = nearly 25,000 acres, almost double the size of Sherman Island. Do you think that landowners/farmers in the Delta will support losing nearly 5% of their agricultural land? Martin, I’m not convinced that governance reforms is the solution. Leadership and public communication is. At this point there is enough (science) to go on for the Governor to make a case for his best guess at what is the best option. Right now there is too much vagueness, ambiguity, and keeping-your-options-open strategy in the CA water political arena. Just do a damn cost benefit analysis of the three (or four, if one includes status quo) options, and put cards on table. JF. What you say about interests blocking governance reforms is certainly true. That simply defines that the character of the effort needs to be focused in the political arena. Stakeholders are seeing how the two parties are bargaining away their vital water interests and simply manipulating the urban vs. rural conflict for electoral gains. They are not demonstrating the ability to reconfigure any water management systems so they are inclusive and accountable to their fellow stakeholders. The OSE is becoming an administrative water czar and has gone beyond the technical requirements of the post. I worked nine years in the Water Assembly, and the thing that impressed me the most was how it was structured around users, specialists, managers, the environment and stakeholders and how it developed a focal point in the conversations engaged in at the committee levels. It did not inherently produce agreement, but it did clarify the fundamental cornerstones of the stakeholders’ concerns and enabled people to get a real perspective of where people were coming from. The MRGWA demonstrated that collaborative processes bring out the best and worse, but without it the decisions are left to parties who are not impacted at all by them. Skin in the game means that the trade-offs are real and not just posturing or based on the tax issues. We need to make water issues really about water so that solutions can be real and not just sops thrown to the peasants. Martin - In the years since you left, the failings of the New Mexico water planning process have become manifest, though. The process failed for precisely the reason I suggested above - the entrenched interests who might have incurred costs as a result of participation were able to walk away at zero cost. In particular, the MRGCD, the Albuquerque Water Authority, the municipal governments, the OSE and ISC, all operate in roughly the same way they would have if there had not been a MRG Water Plan. The problem here is that all the players involved have their own legitimate incentives and motivations, which are often in conflict, and the water planning process included no governance teeth to overcome those dissonant interests. JF- I agree with you totally. MRGWA already looked at a no change scenario in its plan. so, we know NM is walking into nothing but lose-lose scenarios. California loves public drama too much. Demonsrators demonstrate, Occupiers occupy and State Legislators legislate. Which one do you think gets their way? John, I don’t think we do disagree on the need for more science. Just as there are competing camps of “science” there are competing political positons.The only thing holding up a “political” solution is the perceived need to base a solution in science. Why do politicians feel this is neccessary ? To maintain some semblence of credibility with 99% of their constituents. Absent this the Big money wins and the Delta is sacrificed. You’re right, “likely” is not a ringing endorsement. I know many landowners in the Delta, but, I don’t know nearly enough of them well enough to give you a definitive answer. At the risk of digression the Google hit map of KQED’s interactive Delta map that you reference in your latest offering should illustrate to all who is paying attention and who is not. As to your calculation of acreage required to build fortress levees and the willingness of Delta landowners to support it one only need look at the BDCP’s estimated need of 65,000 acres to mitigate a conveyance as opposed to your estimate of 25,000 acres needed for fortress levees to realize that for Delta landowners this is a no brainer. Will Delta farmers “like” losing acreage ? Hell No. No more than Stewart Resnick won’t “like” not getting all the water he and his 1%‘er buddies want. BTW, virtually every recreational facility/public access both privately and publicly owned is built on one or both sides of the levees in the Delta. Needless to say a fortress levee approach will have have significant impacts and result in serious disruption to our businesses that could well be fatal to some. Speaking only for myself, I think the benefits to all far outweighs the negative impacts to some. Chris, I recently visited the new Resnick-attributed contribution to the LA County Museum, designed by an eminent European architect. They, whoever they are, clearly cut costs on the promise of the project. A proper museum doesn’t ask its visitors to ponder art while looking at wind blown debris hovering in its light source. LACMA’s benefactors therefore do not have my sympathy, and raise my suspicions as to their other initiatives. You are of course correct that if a fortress delta project were to be built, it would have especially profound implications on landowners who depend on levee-based operations. It would be a big change. That is why I still have a soft spot for the peripheral canal. If science has a role at this late date, it would be good to know whether its redistributive capabilities could improve the Delta’s habitat.